The emirate of Kuwait is situated on the Arabian Peninsula in the Persian Gulf. 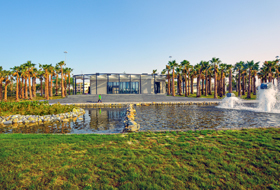 In the capital, Kuwait City, the Al Shaheed Park, 355,000 m² in size, has been developed as a link between the city centre and the outskirts of the city. The work was carried out in two phases to date. 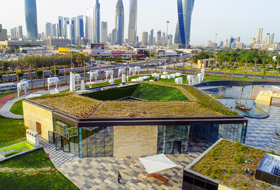 This green belt is the most significant infrastructural project in Kuwait and is at the same time, at 55,000 m², the largest green roof project ever undertaken in the Arab world. The complete greening of all underground car park roofs here allowed for the creation of a continuous parkland. The hot and arid climate posed a particular challenge. For this reason, the ZinCo system build-up “Landscaped Underground Garage” was chosen as a stable foundation for the vegetation and paving. This was already the case with the underground car park in Phase I and it is the same with Phase II, which is the subject of this report. The Al Shaheed Park is at ground level in the middle of a densely built-up area and a network of very busy roads that criss-cross the park. However, the green belt is designed in such a way that the individual areas in the park are all connected to each other. This is done with tunnels beneath the roads. The terrain is slightly profiled which provides for a certain level of noise and visual protection thanks to the topographical design and the surrounding vegetation. There are pedestrian entrances to the park on all sides and also bridges from the adjacent city districts. Car users use the numerous parking spaces in the multi-storey underground car park and then access the park through the staircases from the underground car park, that is to say, directly into the centre of the park. 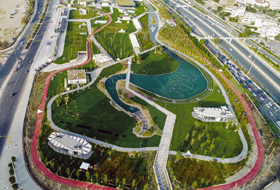 The name “Al Shaheed Park” means “Park of the Martyrs”. It is a chronicle of the country, Kuwait, and its history and culture. Between 2013 and 2015, approx. 220,000 m² of parkland were developed during Phase I which included wonderful botanical gardens and walkways for strolling, lakes with fountains and a waterfall, Thekra, the historical museum and Habitat, the environmental museum, sculptures, visitor centres and, of course, restaurants and souvenir shops. 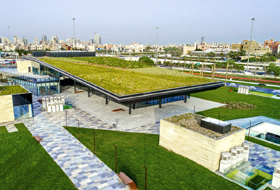 In addition to the green roof of the underground car park, virtually all the roofs of the buildings mentioned above are greened – together approx. 31,000 m². An additional 135,000 m² of parkland were added between 2016 and 2017 during Phase II of the project. 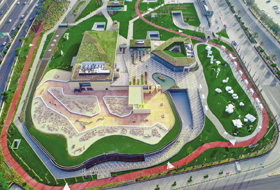 There is an amphitheatre, a multi-functional event venue and an exhibition area for architecture (miniature depiction of the old and the new Kuwait) between the green areas, the walkways and the water areas. 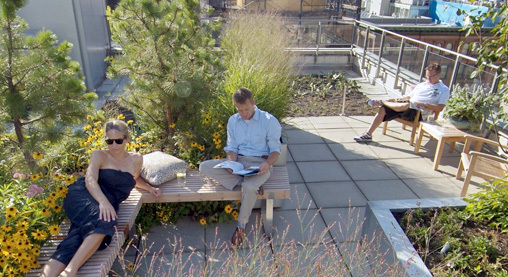 The many buildings with their green roofs highlight the ecological character of the park. 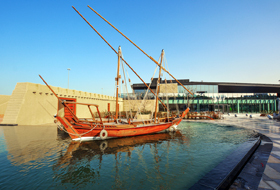 Above all, the parkland with its water features, musical fountain, miniature Old Kuwait and New Kuwait miniature with video mapping intended for all ages. The different types of elements can all be installed on the 24,000 m² roof of the underground car park, which is the focus of this technical report. The green areas are all criss-crossed with walkways and driveways that are used not only by pedestrians and runners but also by vehicles (golf buggies for visitors, gardeners’ and delivery vehicles). The pathways and jogging tracks are also situated on the roof of the underground car park, which, incidentally, was subjected to considerable loads during the construction phase (used for wheel loaders and storing construction materials). Therefore, if you have greenery in combination with pathways on the roof of an underground car park, it is not only water retention capacity or drainage that is important but primarily the compressive strength of the system build-up. The first layer of the ZinCo system build-up installed on the 1 %-pitched, root-resistant, waterproofed concrete roof of the underground car park was the Protection Mat ISM 50. This 6 mm thick synthetic fibre mat is mechanically highly resilient. 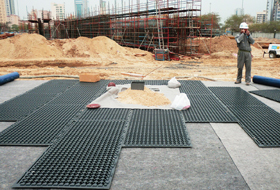 It was followed by Stabilodrain® SD 30, a 32 mm thick, extremely stable and pressure-resistant drainage and water storage element. The approx. 1 × 2 m elements made of thermo-formed polystyrene were quick and easy to install in a staggered pattern thanks to the interlocking connection studs along the longitudinal sides. Once the cells in the elements were filled with a mineral pumice mixture, the high-grade system Filter Sheet TG was installed, a tear-proof and nonrotting filter fleece made of polypropylene. Finally, a locally sourced (mixed) substrate was added to a height of between 0.4 to 1.5 m. This substrate subbase is used for pressure distribution given that when vehicles are being driven over the surface, not only do pressure loads occur at the contact areas but horizontal loads also occur due to breaking, steering and accelerating. Furthermore, the selected build-up height is in line with the required profile of the terrain and naturally of the vegetation itself (size of the root balls of palm trees and other trees). 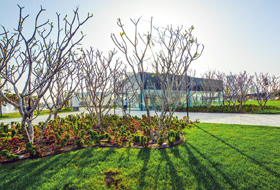 For the vegetation layer in the Al Shaheed Park, native plants which are suited to the sub-tropical climate were used exclusively. Mention should be made of the many date trees and other types of tree such as the acacia arabica, the lemon tree and the Prosopis Chilensis. A total of 1500 trees were planted during Phase II. The selected shrubs are also ideal for the arid location, for example, the desert Rose, oleander, agave and the Euphorbia Tirucalli, as are the herbs such as Rosemary and ground cover such as Portolacaria and Carissa. The Saint Augustine, among other grasses, is typical for sub-tropical climates. In total, 25 different types of plants were used which, regardless of the specific suitability for arid locations, are reliably irrigated by means of an automated irrigation system. Their response to that is magnificent growth. Not only were the above-mentioned 24,000 m² of roof area on the underground car park lushly planted in this manner but an additional 39,000 m² of surrounding green area too. The paved surfaces account for approx. 21,500 m². Particularly noteworthy: the synchronisation of the vegetation in Phase II with the existing vegetation from Phase I was a huge success and only one vegetation period was available to do this. For this reason, for example, the trees that were planted were relatively large. This challenge was mastered superbly, as was the overall coordination and synchronisation of schedules with the other trades during the construction phase. 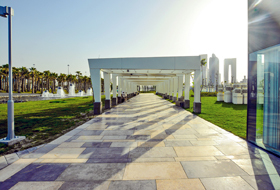 The Al Shaheed Park is of immense importance for Kuwait and its visitors from all around the world. It is a social meeting point, a cultural oasis and a window onto the history of the country. It offers relaxation amidst greenery and an incentive to undertake the widest variety of outdoor activities. Due to its enormous size, the green belt is capable of reducing air pollution and it also acts as protection against sand storms. The lakes too are of ecological value as they are used as reservoirs during the hot summer months. 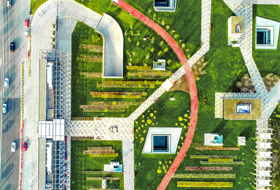 A successful project with a future – the plan to continue the green belt is already under way with Phase III, involving an additional 30,000 m² of green roof area.